Soybean protein isolate (SPI) is a kind of whole protein food additive produced from low temperature dissolving soybean meal. Soy isolate protein contains more than 90% protein, nearly 20 kinds of amino acids, and essential amino acids. It is rich in nutrition and does not contain cholesterol, which is one of the few species of plant protein that can replace animal protein. Pea or other beans can also be the raw material to produce isolate protein. Disolving extraction: the soluble protein and low molecular sugar were extracted by soaking low temperature defatted soybean meal with weak alkaline water solution (NaOH), and then separating insoluble fibers and solid residue by centrifuge. Acid precipitation: add a certain amount of hydrochloric acid solution to the dissolved protein solution to regulate its pH value, and then use centrifuge to separate the precipitated protein gel. 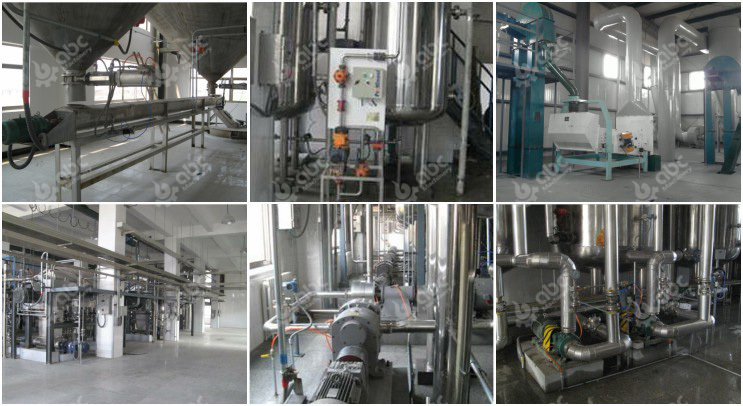 Neutralization, homogenization, sterilization and spray drying: homogenize and sterilize the separated protein, then vacuum flash evaporation and pressurization and spray drying, to get the powder soy protein isolate product. In the first step, dissolution and extraction are performed. By taking advantage of the dissolution property of soluble protein, we use weakly alkaline aqueous solution (NaOH) to soak the defatted soybean meal to extract soluble protein and low-molecular-weight sugars, and then insoluble fibers and solid residues are separated by a centrifuge. 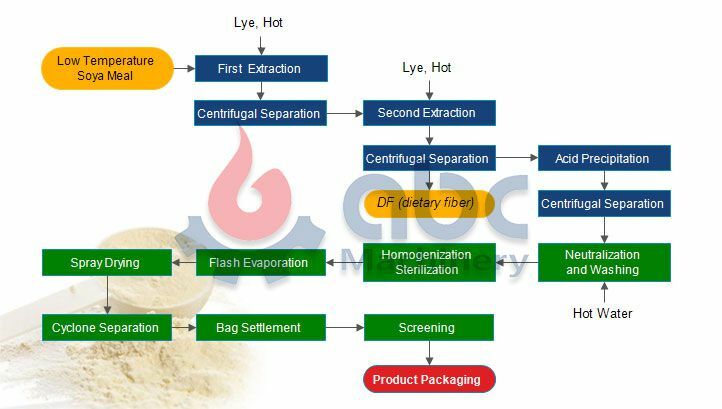 In the third step, neutralization, homogenization, sterilization and spray drying. the separated proteins were homogenized, sterilized, vacuum flashed and pressurized and then spray dried to obtain powdered soy protein isolate products. The overall system uses monitoring to prevent leakage material in the production. Pathogenic bacteria must not be detected. Inspection standards are carried out in accordance with existing domestic standards. 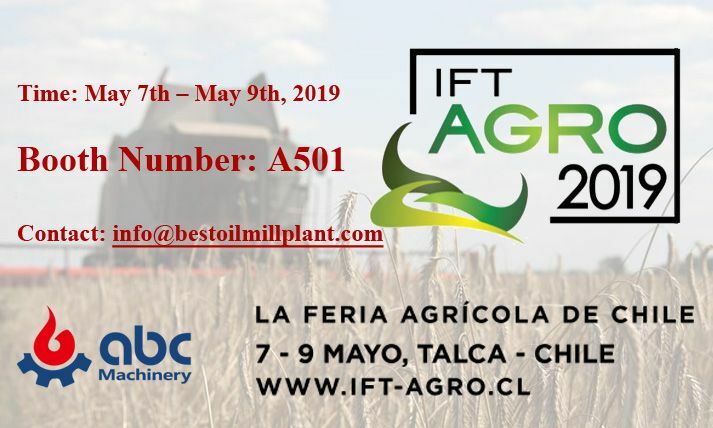 Cleaning (screening and selection): Screening to remove iron impurities, large miscellaneous, straw, stones; selection to separate soybean beans. 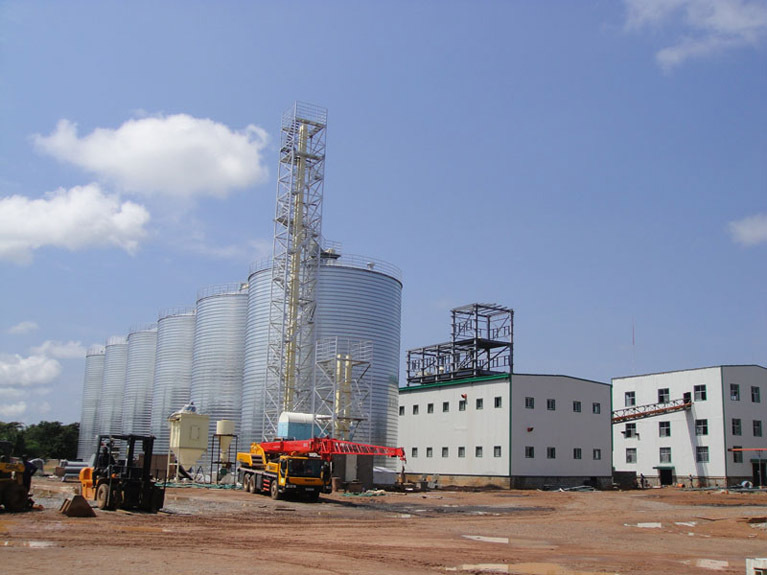 Conditioning: Using a low-denature drying tower and fluidized bed for rapid drying, which not only ensures the peeling rate of the peeling process to increase the protein content, but also guarantees the invariability of the soy protein. Peeling: Peel the soybeans with a peeler and a seed screen to increase the protein content in the soybean meal. 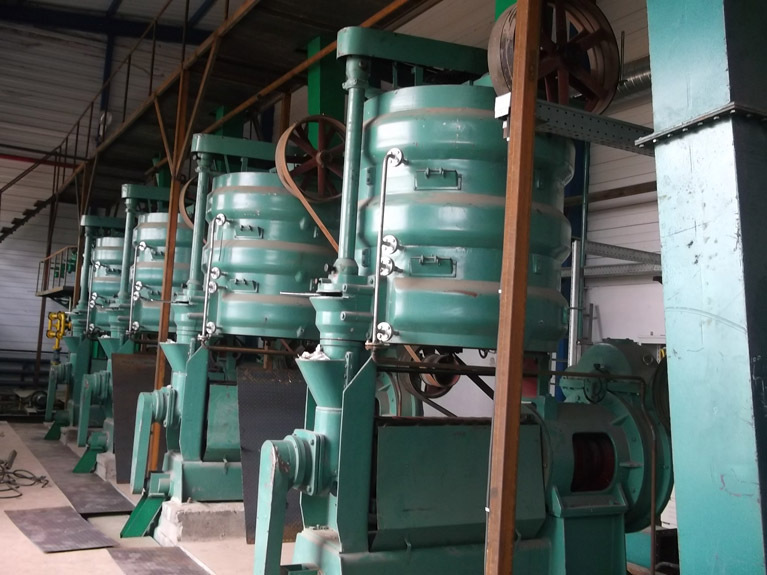 Softening: Improve the plasticity of the soybean material, so that the flakes rolled by the flaking machine are thin and not broken, thereby improving the extracting effect. Flaking: The use of hydraulic compact roller mill can better destroy oil cell structure, to ensure that the rolled flakes are thin and uniform, ductile, and low degree of powder. Extracting: Advanced towline extractor, stainless steel grid, frequency control of feed and discharge material, feed material level automatic control, stable production, low residual oil, low solubility. Low temperature desolvation: It adopts digestion and absorption of world advanced technology: A+B tank desolvation process. The low temperature soybean meal obtained from this technology has high NSI (nitrogen solute index), uniform and complete flake, complete desolventization effect, and energy saving. Mixed oil evaporation: Evaporation system uses negative pressure evaporation, using 1st steaming, energy saver, jet heat exchanger, oil-and-oil heat exchanger to make full use of the waste heat of the secondary steam of evapo-separated machine, jet pump exhaust gas and raw oil, which is advanced and energy-saving. 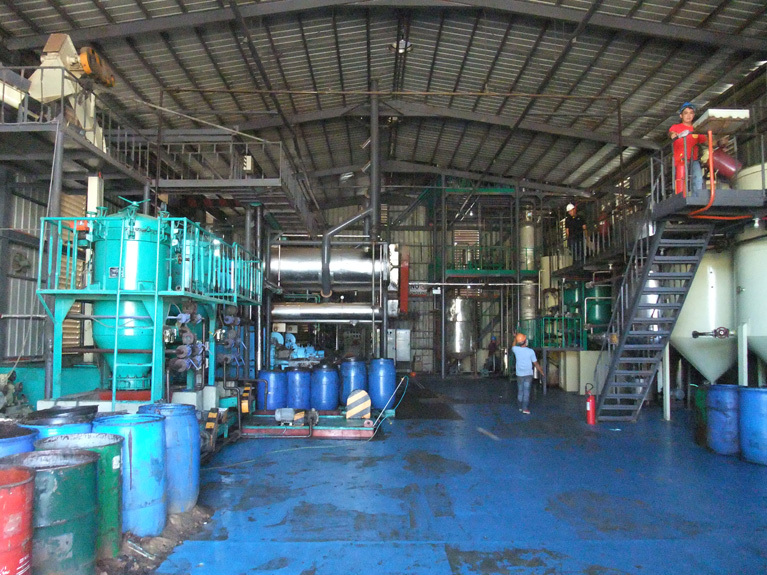 Solvent recovery cycle: Most of the solvent gas is recovered, recycled after water diversion, while the tail gas containing trace amounts of solvent enters the tail gas recovery system. 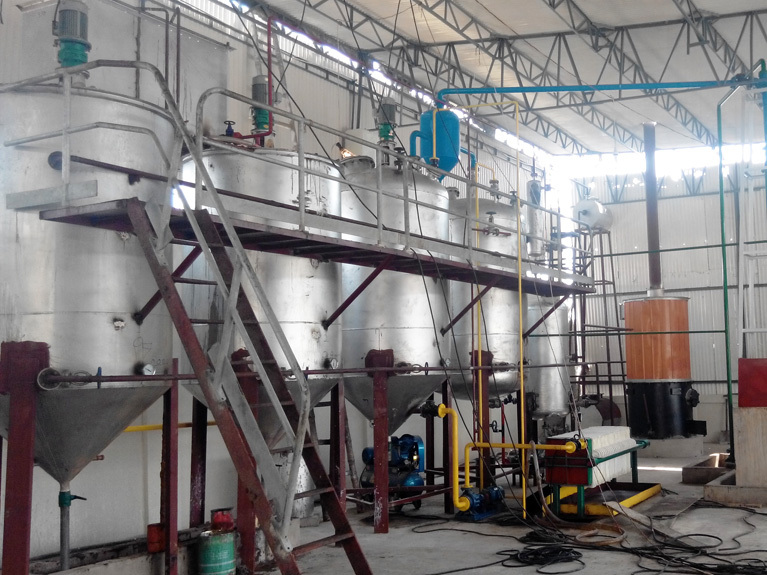 Tail gas recovery: Tail gas paraffin absorption system can effectively intercept difficult-to-condense solvent gases, and the scientific and advanced condensate system configuration ensures good process indicators. All processing equipments operate continuously and mechanically. Under the premise of guaranteeing advanced technology index, the process is comcise, the equipment investment is reduced, the failure rate and the maintenance cost are decreased, and the space is fully utilized to save the land and the energy is saved by fully utilizing gravity. This technology adopts current international level extractor and cryogenic desolvent machine with reasonable structure and reliable operation. A specially designed negative pressure evaporation energy saving technology is adopted, which greatly reduces steam consumption. The full negative pressure evaporation avoids the oxidation of oil. The separation of oil and solvent is realized at a lower temperature, which ensures the quality of the extracted oil, improves the refining rate, and significantly reduces the energy consumption. Reasonable selection and matching of condensing system equipment can effectively enhance the condensation effect.